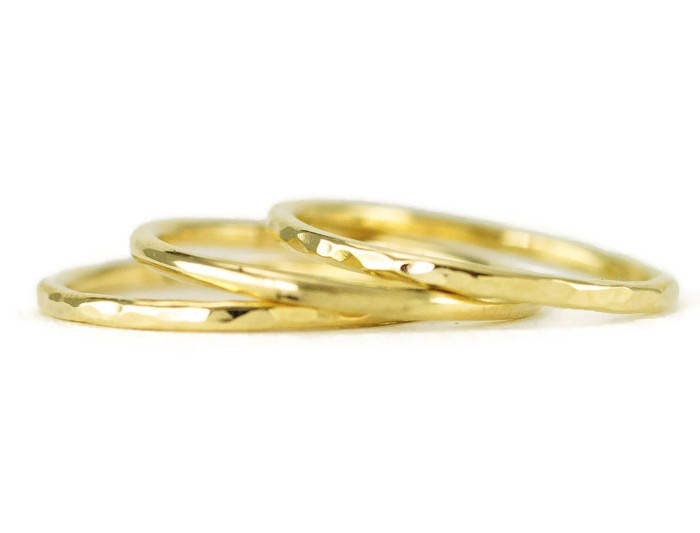 A simple solid 18k or 22k hammered gold wedding band for the minimalist as a solid gold ladies wedding ring or lovely yellow gold stack ring. Created from slender 1.6 mm full round wire, this ring has been hammer forged for a casual look with beautiful facets that catch the light. This recycled thin gold ring can be worn with an engagement ring or as an everyday stacking or spacer ring with other rings. I hand forged the band to create a texture, like facets, to catch the light. I show the smooth finish, also available, in other photos. This style is also available in 18k rose gold, 18k white gold and nickel free 18k Palladium white gold, just contact me for pricing and a custom listing. Important - Please write your style and finish preference in notes to seller at check out. I will need to contact you if the information is missing which will cause a delay in shipping time. In a bit of a rush? Waited just a bit too long to order your bands? I stock most gold on hand for wedding rings listed in my shop, most rings will ship in 3-5 business days after order except during major holiday ordering season or unless you request hand engraving or something special not seen in the listing. Please message me in advance to make sure I can meet your need by date. If you have waited way too long- please consider upgrading to express shipping to insure prompt delivery. Each of my rings comes in a ring box suitable for gift giving. Included with your ring is a draw string pouch for storage and jewelry care instructions. This ring is made to order from scratch, it is not ready to ship in any size so please allow 7-10 days for me to make your ring and add that to the ship time! If you are in a rush and need your ring sooner, please contact me in advance to discuss your needs. Arrived within 2 days of order. Beautiful ring, exactly as described. Thank you for such great service! I would definitely purchase from this seller again.